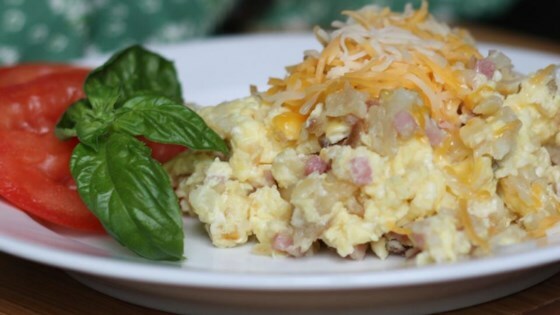 "This is a fantastic dish to serve for a Christmas Day breakfast or brunch." In a large skillet, fry bacon pieces on medium heat until brown and a little bit crispy. Set aside bacon. Cook and stir shredded potatoes in bacon drippings on medium heat until tender. In a large bowl, whisk eggs, and salt and pepper. Add eggs to potatoes. Reduce heat to low. Cover and simmer for 10 minutes. Sprinkle cheese and bacon pieces on top of potatoes. Let cheese melt. Serve. See how to make a cheesy breakfast strata with bacon and potatoes. I used some leftover boiled potatoes and smoked sausage, about 1/3 lb and 6 eggs, and was enough to feed 4 hungry people. My husband added salsa to his and said very good. We loved it. Also you can use diffrent meats with it. We tried Sausage. Very tasty. We did the recipe as is (for the kids) for a Sunday brunch, but had add-ons for the adults. Sauteed mushrooms, jalapenos, chopped scallions, and pico de gallo. We all liked it!